Grubzon - A Gourmet Voyage: Zoe - Gurgaon. In today's hedonistic world, unhealthy but delicious food dominates people's diet. Many only switch to a better lifestyle when they wake up with their belly obstructing most of their view. While a few have switched to a completely healthy way of life, there are some others like myself who try to find a middle path in things. In the chaos caused by lifestyle diseases and aesthetically unpleasing waistlines, we often look for a messiah. This is where "Super foods" come in. No, these aren't magical elixirs which will convert Jabba the Hutt into Prince Charming instantly. But these will make your efforts count for more. Superfoods often act as a multiplier. And on the top of the list of super foods is Green Tea. Green Tea is said to have quite a few benefits like cleansing the body of toxins, possibly reducing bacterial growth on teeth, accelerating metabolism, improving brain function, lowering cancer risk and removing bad cholesterol from arteries. There are of course more that are claimed by connoisseurs of this apparent modern day panacea. However where there are cheerleaders, they are always naysayers. While Green Tea is no magic potion, the fact is that it works. With so many brands of Green Tea popping up in the market, people often end up buying cheap inferior brands and end up in the naysayer camp. And after sampling about a dozen or so brands, I came across Zoe. Zoe meaning "life" in Greek, is a health food brand operating out of Gurgaon. Worry not, as they deliver all over India. I sampled Zoe's Seven Day Tea Detox program. This consisted of four different teas to be taken at four different times of the day with an elaborate meal plan. This was a detox diet - something which costs a fortune if obtained from a dietician. Though given my lifestyle, its hard to follow it to the letter. Thus, I tried the detox sessions in small windows. 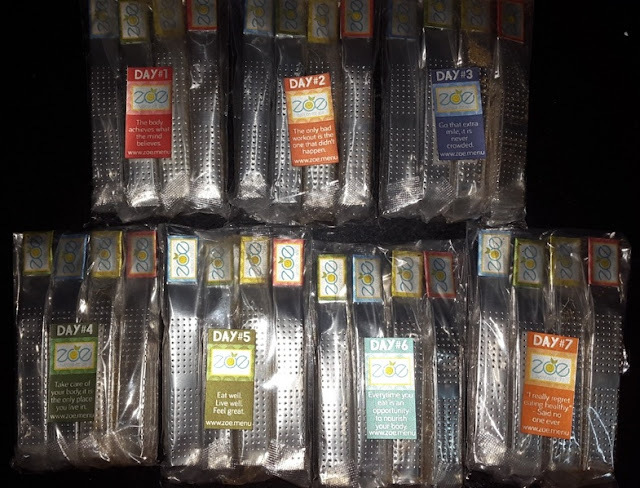 These teas were neatly distributed in smart tea bags which served both as a tea bag and a spoon. It was a very effective way to bring out the complete flavor of the tea, something which most mainstream teabags cannot deliver. The teas were natural and pure without any adulterates as common with some brands of mainstream green tea. Following the scientifically designed schedule provided by Zoe, here is how my sampling went. I started my mornings with Organic Kashmiri Green Tea along with light breakfast. This tea had the best flavor and aroma of the four. It was full of anti oxidants and electrolytes. I do not know about the health benefits but its aroma and its cleansing properties made my day start quite positively. Lunch was complemented with First Flush Darjeeling Black Tea. This was more of a traditional Darjeeling chai minus the milk and the sugar. This tea was an indicator of how natural Zoe's teas truly are. We have all had Darjeeling black tea before and it was thus easy to compare and determine that this had a superior flavor, aroma and experience. It felt as if you were having tea right off a tea estate. High Tea with Daily Detox Darjeeling Green Tea. The classical green tea from one of the best tea estates in the world. This one was all about flushing toxins and cleaning arteries. This was the green tea which we have heard so much about. And again I could compare it with the likes of Liptons, Apollo and my personal favorite Twinnings. Zoe's quality exceeded that of Twinnings. Shame its not as commonly available as Twinnings. Late night Organic Chamomile and Lemongrass Tea was more of a Herbal tea which was an instant mood lifter. By night, one often becomes weary with the weight of the world. This tea lightens the load. It won't give one wings but would surely de-stress one with its pleasant aroma and herbal flavor. I must secretly admit that I actually loved this one the most. Again, I wont say that Zoe produces magical potions. But from my experiences - I did lose about three quarters of a kilo in the week. My mood improved and I was not grumpy at all. The cleansing effect of the green teas made me feel light as a feather during the day. And most importantly, following this schedule made me re-discover my love for Green Tea. I am now at least having two cups a day following a schedule similar to the one designed by Zoe. Maybe its real or maybe its just my mind but the fact of the matter is that Zoe's Seven day detox had a lot of positive effects on my daily life. It is another thing that I could not maintain the strict discipline of the schedule but even partial discipline yielded me benefits. Whether you are a Green Tea believer or a skeptic. 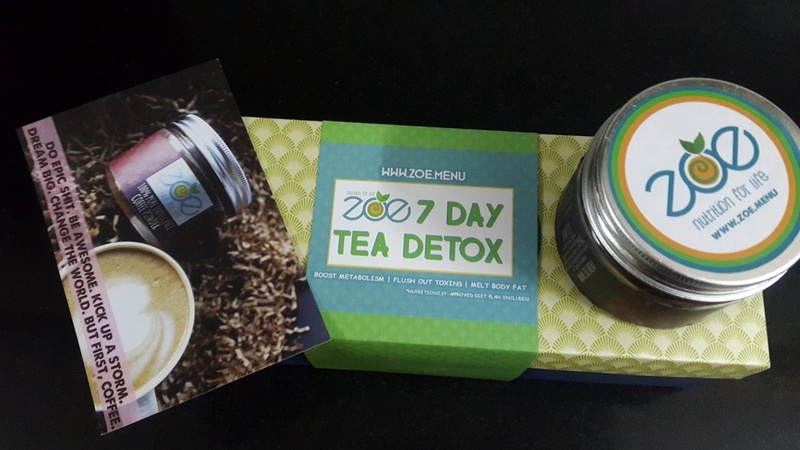 If you are serious about detox, good health and improving your metabolism - Do give Zoe's Seven day Tea detox a try. Click here to check out Zoe's website.